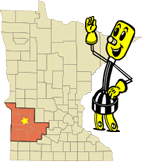 Minnesota Valley Cooperative Light and Power Association is a member owned rural electric cooperative. Our main purpose is to provide affordable, safe and reliable electricity to our members. Minnesota Valley REC also offers many other programs and services to its members. If you have any questions or comments about your cooperative please contact us. Thank you for visiting our website! We have several options available to make sure you find the cooling system that best meets the needs of your home or business. Whether you’re adding a new service or upgrading an existing service, let our Operations Department assist you with the process or other questions you may have. Looking to reduce your energy use and save money? There are a variety of ways your cooperative can help you make your home more energy efficient. From stray voltage investigations to high usage concerns, let our Member Services Department help you with your electrical needs. The First Call system is a specially designed medical alert telephone system for the elderly, disabled or anyone who lives alone. Providing high quality customer service to our members, the Office Department can help assist with your billing and other concerns.